As a budding fruit grower with limited space, I’m very careful as to how I use my real estate. Since I’m also a wildlife gardener, none of my fruit can be sprayed; everything has to be disease resistant, or with problems the garden and I can tolerate. The latest addition to my garden is the hardy kiwi. This kiwi is much different in appearance from the traditional fuzzy kiwi. Hardy kiwi is sweeter, grape-sized, and fuzz-less. 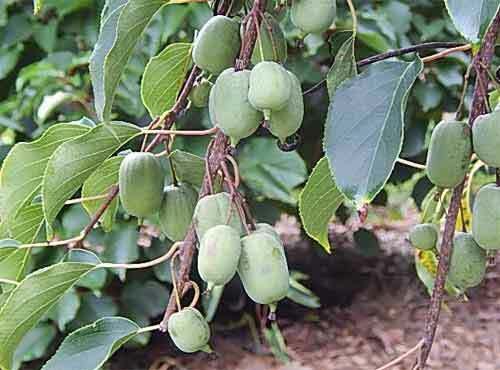 Since I’m so new at growing hardy kiwi, and frankly I didn’t know it existed before visiting my friend John Buettner’s garden, I reached out to John to share his expertise. Give it a lot of space. Hardy kiwi can grow 15-feet in one year. Try growing it over an arbor in a sunny location. Hardy Kiwi takes time to produce fruit. I don’t expect to see any fruit from my fledgling plants for one to three years. But it will be worth it. Like many fruits, hardy kiwi needs full sun and constant moisture to thrive, though it does not tolerate wet soil. Plant it in a full sun location with rich, well-drained soil. It will suffer in times of drought unless watered. Deer may browse the vine, but will soon it will be out of the deer’s reach. For my hardy kiwi, I built a trellis from limbs after removing a crape myrtle tree. Soon it will be covered, creating a beautiful display on the south side of my garden. Most hardy kiwis need a pollinator so I asked John about the ‘Issai” vines, known to be self-fertile, and do not require a male pollinator. “I did get a good crop of fruit from them,” John says. Even with this advice, I bought one self-fertile ‘Issai’, and a male and female just to be certain. John’s garden has five hardy kiwi vines: two female Actinidia arguta ‘Annas’, one male A. arguta of unknown variety and one A. purpurea ‘Ken’s Red’. I’m growing Actinide arguta. If you are a budding or hopeful fruit grower, starting with hardy kiwi is a good place to begin.